This week in MiddCreate Spotlight we are highlighting a MiddCreate site created by Tom Dils, a Middlebury College graduate. Tom was kind enough to answer some questions we asked him about his work with MiddCreate. ODL: What is the purpose of your MiddCreate site? 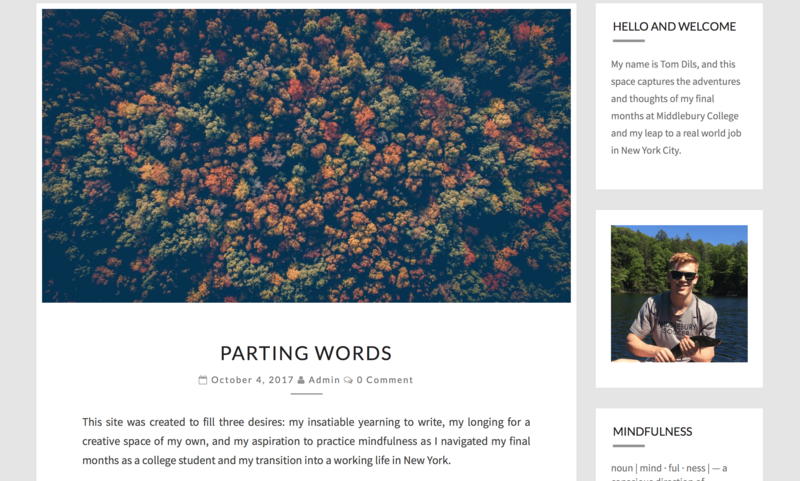 Tom: My site was designed to be a multi-purpose digital space where I could pursue a range of creative outlets and stash away memories and thoughts from my final months as a Middlebury student. I would classify the content of the site into three categories: the blog posts, a portfolio of my favorite essays over my four years, and a gallery of my own photographs. As a whole, it tells the story of my transition from Middlebury to my first job as a graduate. ODL: How did you discover MiddCreate? Tom: I discovered MiddCreate through my Design Thinking class in Fall 2016. Professor Antonioli had our class work through a design thinking process in which we familiarized ourselves with the platform and devised ideas for how to make it more accessible to students and faculty. Tom: I installed WordPress and used what I’d learned from my experience working with WordPress at a summer internship to design the site. Tom: No further plans; I ended the blog when I felt settled in my job in NYC. Tom: Using MiddCreate, or doing any website/app/software development, requires a ton of trial and error. That being said, keeping a consistent, unifying theme or purpose in the back of your head as you’re testing out ideas and trying new apps is the best way to ensure you reach your end goal. ODL: What are your general thoughts on MiddCreate? Tom: MiddCreate is a unique platform that I wish I’d had for all four years at Middlebury. I think that as students become more comfortable using MiddCreate, the possibilities for how it can be used begin to multiply. Philosophically, I appreciate that a personal MiddCreate site has no obligation to conform to what is already out there (Facebook or LinkedIn profile, for example). ODL: How do you believe having this platform has helped you? Tom: MiddCreate gave me a place to “journal” with the added benefit of learning WordPress and improving my photography.